Cut small crosses in the bases of about 1Kg of ripe tomatoes, drop them into a pan of boiling water, leave for 30 seconds and then lift them out with a slotted spoon. When they are cool enough, peel and roughly chop. Heat a 'glug' of good olive oil in a pan (my neighbour, Guy, has recently returned from Crete with a sash of his own olive oil, and I'll use that! ), and fry a small chopped onion with a pinch of salt for 10 minutes until softened. 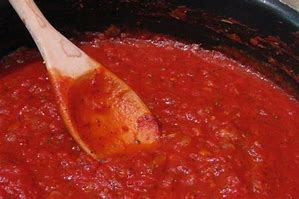 Stir in 2 chopped garlic cloves, add the tomatoes, and then simmer for at least 30 minutes or until you have a rich and thick sauce consistency. Season to taste with salt, pepper and a squeeze of lemon juice. 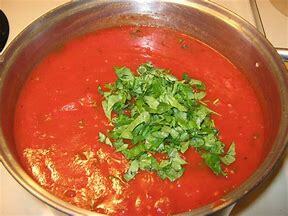 Add chopped fresh basil. There'll be enough sauce for a good pasta coating, but save some for another day by freezing it in an air tight container.